Tonight, I saw The Amazing Spider-Man, the top ranked movie at the moment. It was a good movie and was very entertaining. However, this is the second installment of Spider-Man in recent years, and both face a problem. It doesn’t matter who stars – Tobey Macguire or Andrew Garfield. It doesn’t matter if it’s in 3-D or on IMAX. It doesn’t matter how many cameos Stan Lee has. No Spider-Man can compete with this one. 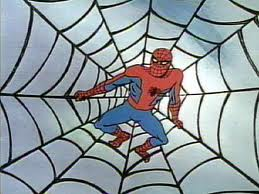 I grew up watching reruns of the 1960s cartoon version of the superhero. The background was frozen, and the characters barely moved. But, I couldn’t wait to see what villain would show up next. 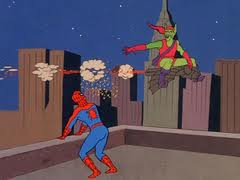 The Green Goblin was my favorite. He had an awesome flying cycle and threw flaming jack-o-lanterns. At least, they looked like jack-o-lanterns to me. However, the coolest part was the theme song that stuck into the minds of kids everywhere. So cool, it was covered by The Ramones. You know the beat, and you know the words. Look out: Here comes the Spider-Man. Hey there– There goes the Spider-Man. And remember, the cartoon is always IN COLOR.